When you’re in the kitchen with no kitchen range hood, it can be all too easy to trap odors, fumes, smoke and airborne grease in the enclosed space. This is particularly true if you’re cooking an odorous meal such as curry or baked fish. However, if you have a kitchen range hood, also known as an exhaust hood or extract hood, your kitchen can smell as fresh as it did before you started cooking. There are many different range hoods to choose from, but all of them have one task: to remove the smell and steam often released from food as you cook and prepare it. They can remove airborne grease, fumes, smoke, odor, heat, and steam, all through the air and filtration system within the range hood. Sone offer better fans than others to extract at a far better rate, while others cover a larger area to ensure no smells linger. As not all kitchen range hoods are created equal, it’s helpful to do your research to ascertain which is going to be the best range hood for you. We’ve included nine top-rated kitchen range hoods below. You are sure to notice a difference in the air and filtration in your kitchen with any one of them. If you have a contemporary kitchen of which you are proud, then this Fotile kitchen range hood will fit right in. It doesn’t matter whether you have a cabinet kitchen or not, as long as you’re happy with the style, this flat-design range hood with three installation options will fit right in. It offers a quality centrifugal fan system to absorb the odors and fumes of cooking faster than a standard extract hood, and it even operates quietly so you can listen to what’s happening around you easily as well. What’s more, it will open automatically once you turn it on, giving you control over how much ventilation you require at the same time. It has a 30-inch fume inlet, covers six square feet, offers a powerful light for better visuals while you’re cooking, and even has a time delay function to ensure all fumes are absorbed efficiently. Everything about this kitchen range hood is designed to make your cooking experience more beneficial. Unlike many other range hoods for sale, this one also comes with an oil cup and folding oil filter. It’s easy to clean, quick to maintain, and can handle more than a regular extract hood. There’s every reason to put this range hood at the top of your wish list today. When your kitchen doesn’t have enough ventilation, it’s crucial to invest in a kitchen range hood. However, if you’re on a budget, finding one that ticks all the boxes but doesn’t cost a lot of money can be tough. You may just find this non-ducted Broad range hood that sits underneath your kitchen cabinets could be what you’re after. Made in the United States, it’s an attractive kitchen range hood that offers one level of lighting, and a rocker fan that moves the air around. What you will first appreciate about this range hood is how it increases your level of visibility. Once you install a new 75-watt bulb into the overhead range hood light, you will benefit from an improved viewing of your cooking immediately. You are also sure to be impressed by its range of features. 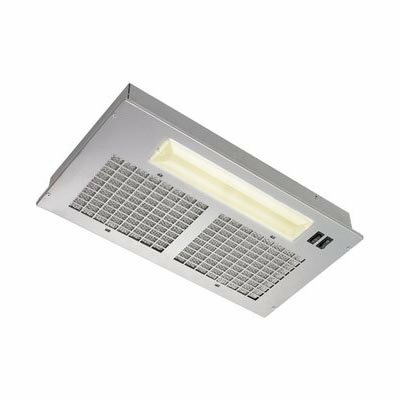 As it’s non-ducted, it requires minimal installation effort except for needing 18 inches of space above it, and it removes smoke and odors effectively. It’s also compact in size at 30 inches by 17-and-a-half inches and fits into any kitchen design with ease. You can cook curry, fish, or any odorous food to your heart’s content and reap the rewards of a fresh and beautifully smelling kitchen. When you’re tired of the smell of cooking permeating throughout your home, you need this wall-mounted kitchen range hood from Cavaliere. Designed to make short work of cleaning the air after heavy-duty cooking, it’s going to be everything you need in your kitchen and more. 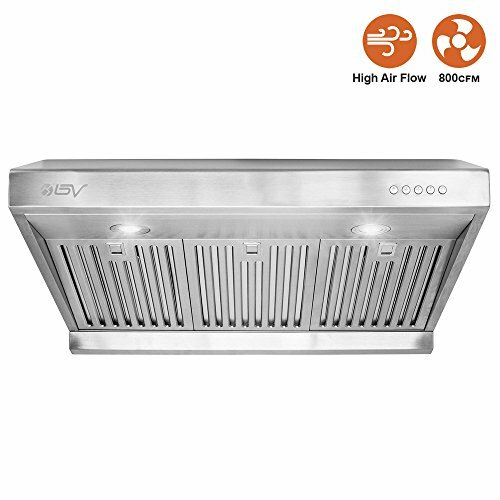 Aside from its beautiful brushed stainless-steel appearance which helps it to stand out in a league of its own, this kitchen range hood offers a range of convenient features to assist you in the kitchen. 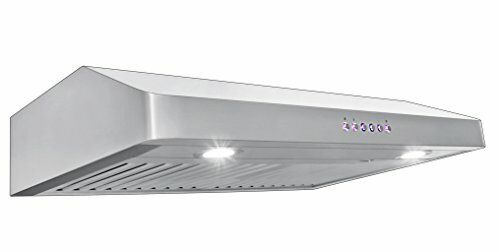 Its two 35-watt lights will provide better visibility for sautéing and cooking on the stove top, while the six-inch exhaust duct vent will ensure all smoke, odors, airborne grease, and other food particles are sucked out of the kitchen immediately. 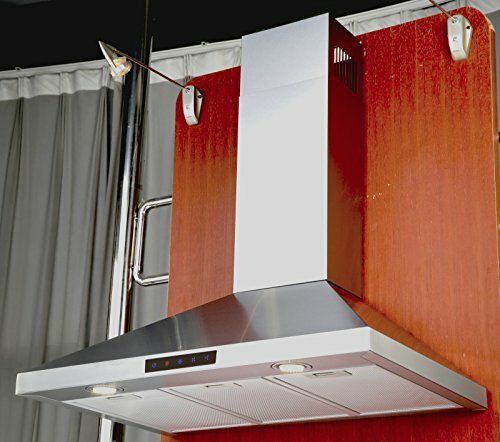 This range hood also features a chimney which fits into ceilings up to nine feet. Its vent must be vented to the outside of your home, and this ensures all nasty smokes, fumes, and odors can be removed from your house as efficiently as possible. If you’re in the market for a quality range hood that ticks all the boxes for a clean kitchen environment, this one is it. Move over traditional stainless-steel kitchen range hood; there’s a new player in town! This beautiful range hood from Z Line is more than just a functional piece of equipment; it’s a stunning feature that will tie into any wood cabinetry within your kitchen perfectly. While it operates as you would expect a high-quality contemporary range hood to, it does so with class, elegance, and style. It features a solid wood exterior, a worn, distressed finish, has a walnut body, a brushed stainless-steel insert, and is tied together with a band and crown in an Antigua style. Not only can it help to remove smoke and odors from your kitchen, but it can end up being a focal piece in your home. However, there is more to this kitchen range hood than just aesthetics. It’s functional, efficient, and will meet your needs perfectly. It offers brilliant air flow thanks to the external venting set up and even has a four-speed fan which you can control. If there isn’t too much odor or steam coming from your meal, you can set it on the lowest air flow, but for those more odorous meals, you can opt to have it on the highest settings. You have all the control. What’s more, it’s easy to maintain and keep clean. The baffle filters, which are stainless-steel, are also dishwasher safe. As such, you can avoid all that elbow grease and pop them in the dishwasher without lifting a finger. This kitchen range hood is going to be a winner in many homes. 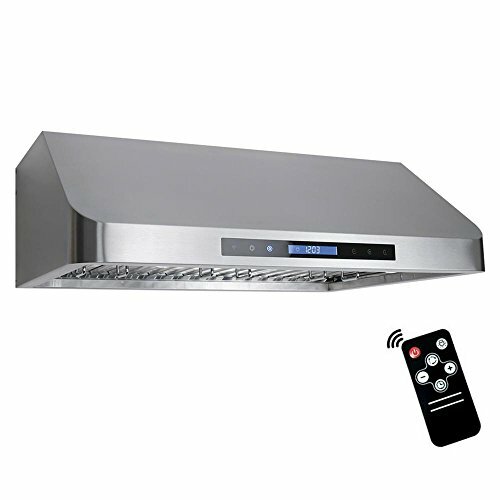 If a basic kitchen range hood just won’t do, you need this industrial-strength wall-mounted range hood from Proline. Designed to eliminate smoke, odor, and steam immediately, you will reap the benefits of a clean and fresh smelling kitchen at all times. To operate this model is simple. It has a control panel with backlighting which enables you to choose the air flow. For those more odorous meals, set it on high, and for simple boiling steam, set it on low. What’s more, it’s so simple to clean it. Just remove the baffle filters and put them in the dishwasher, it’s that easy. Aside from making the air in your kitchen fresh and clean, this kitchen range hood also helps to illuminate your workspace. It features LED lights that brighten up the cooking area and help you to gain more visibility in the kitchen. As a range hood can often add shade to the stove top, this is a welcomed feature. While this is a quality range hood that will fit seamlessly into most kitchens, Proline also ensures you have peace of mind as a consumer. They offer a five-year warranty with each range hood, as well as a 100 percent money back guarantee, no questions asked. This easy-to-install kitchen range hood is going to impress any home cook. It’s affordable, attractive, is easy to install, and can even switch from ducted to ductless. Firstly, it’s important to note just how easy this range hood is to install. It comes with everything you need, including chimney extensions for ceilings up to 12 feet high, and comes with the blower and fan already installed. While it’s ducted, it can become non-ducted by adding a charcoal filter. This entire process can save you a lot of time and hassle. Regarding design and function, it’s a real winner. It has a beautiful stainless-steel outer casing, has tilted halogen lights, has four fan speeds, and has baffle filters that are dishwasher safe. Once they are dirty, just remove them and put them in the dishwasher – you don’t even have to get your hands dirty. What’s even more beneficial about this kitchen range hood is how effective it is. For the price tag, you get a quality-made product that will remove any smoke, odor, fumes or airborne grease with ease. Notice a difference in the smell and appearance of your kitchen in no time. Not every functional appliance in your kitchen needs to be just practical; it can also be attractive – such as this kitchen range hood from Z Line. Designed beautifully with a stainless-steel hood and curved glass, it will suit any home kitchen – whether it be contemporary or classic. But design and function go hand in hand, and this kitchen range hood delivers on both. It comes as a fully-functional ducted unit that just requires your installation, but with the simple insertion of a charcoal filter, it can become non-ducted just like that. Even the removal and cleaning of the baffle filters is easy. Just remove them and put them in the dishwasher. There is no elbow grease or scrubbing required. In terms of how well this kitchen range hood works, you will be surprised. It features a four-speed motor to handle all kinds of odors and fumes and even has a timer and auto-off function as well. What’s more, it has directional lighting which enables you to see your food easier while you’re cooking. The chimney can extend from 31 to 42 inches for your convenience, and this range hood is quiet and convenient to operate. Adding it to your kitchen may be the best decision you ever make. This sleek and stylish under-cabinet kitchen range hood from Broan is set to impress. In fact, by adding this extract hood to your kitchen, you’re investing in a future where no walls, floors or ceiling become ingrained with cooking odors, and where airborne grease goes one way – out the extract fan. It’s a future worth investing in if you’re tired of an odorous, sticky kitchen environment. The blower is a feature worthy of mention. It’s easy to adjust the speed of it, and it even has a memory that recalls the last setting you had it on. What’s more, it detects heat and automatically sets the blower to high. This can save you time as you don’t have to play around with settings. Once you install two 75-watt bulbs, you can also benefit from superior levels of light in your cooking area. While kitchens tend to have great lighting, above the stove is often forgotten about. This kitchen range hood will illuminate your meal like never before. There is also more to this range hood than meets the eye. Not only is it beautifully designed and exceptionally functional. But it’s quiet and easy to install as well. The ducted version is straightforward to connect to the outer side of your house, but by purchasing a ducted filter, you can make it non-ducted in just minutes. Convenient and revolutionizing dinner time, you will love what this Broan range hood has to offer. 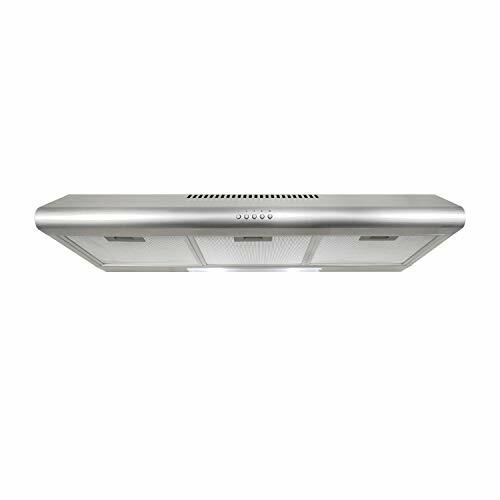 Not all kitchen range hoods are going to suit your kitchen, but if you have a more traditional kitchen and you would like to keep it that way, consider installing this range hood from Sinda. Beautifully designed with rivets, a bronze finish, decorative straps and made from 16-gauge copper, this is every homeowner’s dream range hood. It mounts to the wall with ease, offers a powerful, quiet fan that vents odors out through a roof or wall, and is easy to install as well. What’s more, it comes with dimmable lights that help to illuminate your cooking area. Everything has been thought of with this range hood. The fan operates at three speeds to cater to each kind of odor or fumes, and it even comes with a three-year warranty as well. When you see this kitchen range hood, you’re sure to fall in love, so add it to your wish list today.